This is to inform the public the commencement of the subject Study including its study objectives, approach, work programme and schedule for public consultation. 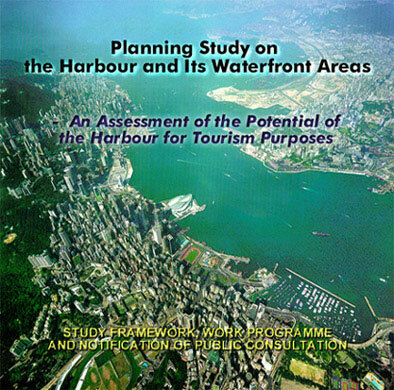 The Planning Study on the Harbour and Its Waterfront Areas - An Assessment of the Potential of the Harbour for Tourism Purposes is a study commissioned by the Hong Kong Tourist Association (HKTA) and managed by the Planning Department, for which a consultancy agreement was signed between HKTA and Shankland Cox Asia Ltd. on 22nd December 1999. In recognition of the Victoria Harbour as an important asset of the people of Hong Kong, the Town Planning Board in October 1999 endorsed the "Vision Statement for Victoria Harbour" (The Vision Statement) setting out the vision and goals for the Harbour. The aim of the subject Study is to translate the vision and goals of the Vision Statement, with specific focus on tourism and related development, into a planning framework to guide the future development of the Harbour. To ensure the Harbour Plan proposals can be well integrated with the metropolitan area of Hong Kong, the Study will be conducted in conjunction with and within the context of the on-going Stage II Study of the Metroplan Review. The outcome of the Study will form a major component of the Metroplan Recommended Strategy to guide future development of the Metro Area up to 2016 and beyond. The main objectives of the Study are to examine the various aspects of the tourism potentials of the Harbour and its waterfront and to promote the use of these areas as tourist attractions. In pursuant to these objectives, the Study will review the existing and planned waterfront land uses in the Study Area, based on which a Recommended Harbour and Waterfront Plan, a Tourism Plan and Action Area Plans will be formulated to guide future developments around the Harbour area. The Study period is scheduled for 8 months (to be completed in August 2000). To ensure public involvement in the study process, there will be a two-staged public consultation. An initial public consultation forum will be held on the Land-use Concept Plans in late 2000. Upon further development of the Recommended Harbour and Waterfront Plan, the Tourism Plan, the Action Area Plans and the related Implementation Framework and Mechanisms, there would be a second public consultation for presenting all these plans to the public for further views tentatively in mid 2001. Public Forums will be held to provide opportunities for the general public including stakeholders to express views at the initial stage of the Study. Briefing Sessions will also be made to relevant public bodies in each stage of the public consultation in order to solicit their views. Websites will be established to provide information to the public on the findings and proposals in each stage of the Study. The Public will also be invited to send in their views in electronic mail or other appropriate forms. Mass Media - the public will be informed of the Study objectives, approach, development options and the recommended plans through press release, briefings and other forms of the mass media.